This program is FREEWARE. Please refer to the license.txt file for more information. 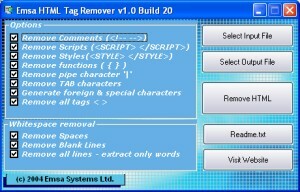 - Remove all tags strips all remaining html data comprised between < and > characters. - Generate foreign & special characters. This is a function that allows rendering foreign and special html sequences into their corresponding resulting character. for example the '£' sequence will be rendered as the corresponding '?' pound character; the '>' sequence will be rendered as the corresponding '>' character; and so on. - Remove spaces will trim all unnecesary spaces from the output; therefore between two words there will always be one space max. - Remove blank lines will cut out all unneded carriage returns and line feeds, in such a way that all lines having some text will be aligned one after another with no blank lines in between. - Finally, remove all lines will cut out carriage returns and line feeds, and the resulting data will be one line of text. this may be useful when only words are needed, like for data to be included in some search database. The program is pretty simple so the above instructions should be enough. When extra parameters are sent to the program in command line, the program does not show the gui. Instead, it silently processses the data, generates the output file and exits. This is especially useful for batch file processing. For best results, please specify the inputfile and outputfile with full paths. if full paths are not specified, the program will look for input and generate output into the same directory. the input and output filename parameters must not contain spaces. To configure the program options for commandline, first run the program once normally, set your options and close it. The program will save configuration in system registry, and when called afterwards in command line, it will use the same settings. If you have suggestions, bugs spotted, requests for new features, please email us. Thanks! Any usual Windows machine with one mbyte of disk space will do. 800x600 min screen resolution. Please refer to the license.txt file for information about support and feedback. Please read the license.txt for licensing information.